Smart phone camera 9-in-1 lens kits enhance camera capacity and create marvelous pictures. It’s easy to put in the pocket and go out for fun! -Lens: Multi-coated HD lens reduces glass flare & ghosting. – 0.63x wide iPhone 6 camera lens capture 45% more picture. 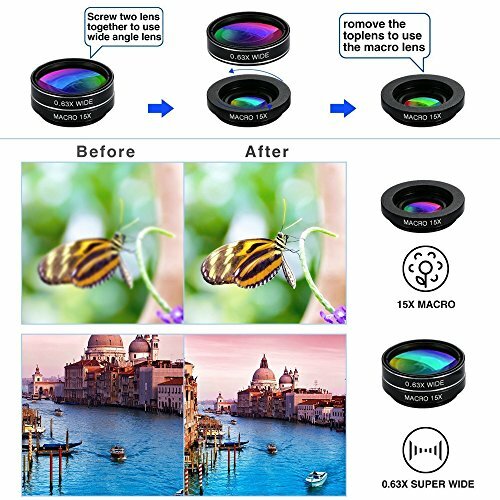 – 0.36x super wide iPhone camera lens capture 120% more picture. – Features: Get clear details for small objects. – iPhone zoom lens gets up close with 2x optical magnification. – Make the lights all come to life like magic with star filters. – Takes you into a stunning fanny world. – Filters polarized light, reducing reflections, enhancing colors and increasing contrast. 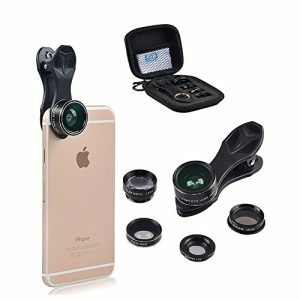 – iPhone 7 Lens attachment is adjustable for effect of polarization. – Fit for iPhone, Samsung and Android smartphones. – Make sure the cell phone camera lens center overlap & parallel with smartphone camera. PROFESSIONAL SHOOTING LENSES: The lens is made of JAPAN optical glass with multi-layers coating to enhance the clarity while shooting. Therefore distortion can be minimized below 8%, which is able to reduce flare and reflection when lens was placed correctly over the phone lens. ☞ Please make sure the telephoto lens focuses on target from at least 3 meters far away for better shooting experience. ATTRACTIVE LENS FUNCTIONS: The 12x telephoto lens allows for a pretty nice close-up of an object from around 100 meters away. The 0.65x wide angle lens completes a photo session of big group. Macro lens enables photography of the structure of small insect eyes, snowflakes, and other minuscule objects. The fisheye lens takes in a 180° hemisphere and projects the scene as a circle within the film frame. The star filter lens reflects the light point and offers us a romantic atmospheres. 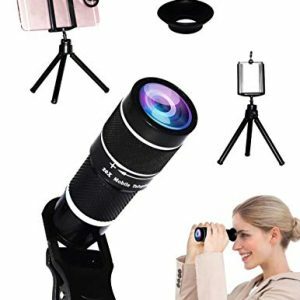 HELPFUL LENS KIT FOR SELFIES: The telephoto lens kit works with tripod and remote shutter included, which offer stability while shooting. The sturdy adjustable tripod allows us to set phone into the holder after lens was attached. 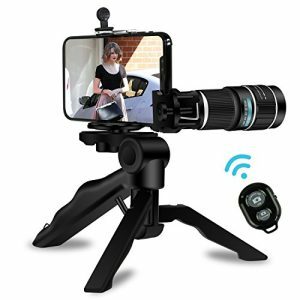 About the remote shutter, it is a nice touch and works well if you want to use the lens kit for selfies, simply pair with your smart phone and then press the button to take photo. PHONE CAMERA LENS FOR EVERY OCCASION: Need to grab a photography of small objects and capture details? Go with the macro lens! Want to capture landscapes or group pics? Use the wide or extra-wide angle lens! How about fun circular photos? Just use the fish-eye lens! As you can see, the Ideal Lenz kit has got you 100% covered! 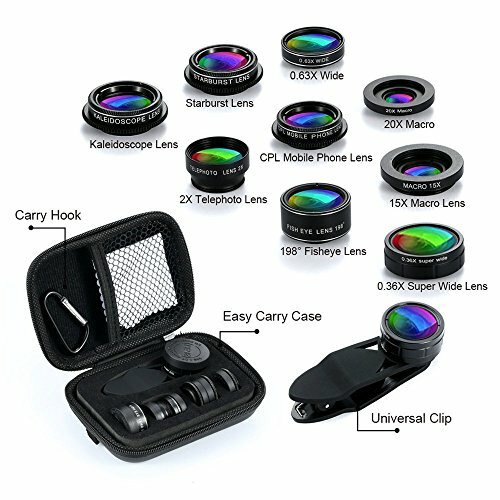 TAKE YOUR LENSES WITH YOU ON THE GO: The best thing with our 7-in-1 lens kit is how portable and compact it is with its unique carrying case! Simply pack your lenses in the included lightweight case and take breath-taking photos on your vacations or adventure travels! 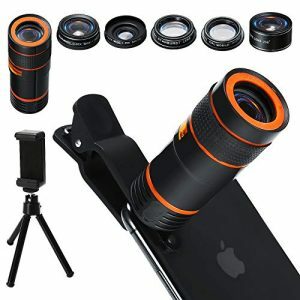 ✔️ Professional Camera Lens： 20x telephoto lens bring around 1200 yards far away subjects closer,make your phone produces close-ups and long-range shots without compromising image quality,ideal for camping, sporting events,bird watching ,fishing, hiking, golf, concerts and travelling. 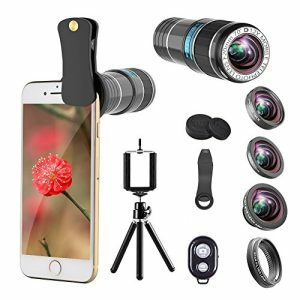 ✔️ Design With Sturdy Tripod And Handly Remote Shutter：This cell phone telephoto lens also comes with a balanced tripod and a remote shutter. We can put the phone into the sturdy adjustable tripod after lens was attached. About the remote shutter, just pair with you cell phone ,and then press the button to get a stunning photo without hand-shake problem. ▶PROFESSIONAL LONG-DISTANCE SHOOTING TELEPHOTO LENS – Kaiess Newest 20x telephoto lens bring around 1200 yards far away subjects closer,make your phone produces close-ups and long-range shots without compromising image quality,ideal for camping, sporting events,bird watching ,fishing, hiking, golf, concerts and travelling. 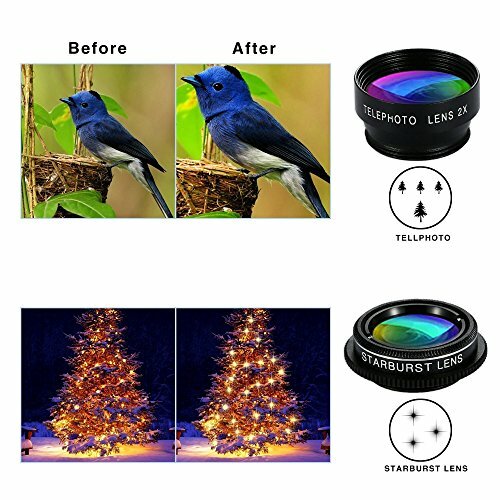 ▶HIGH QUALITY DESIGN AND NO DARK CORNER – Factory based company with professional engineers make the lens with world advanced German Optical Glass to ensure the highest quality photos and transmits the colors and brightness precisely.Rotate the lens eyepiece ring to adjust blurry image and make picture clear.Click and enlarge phone’s screen to ensure the pictures around without dark corner. 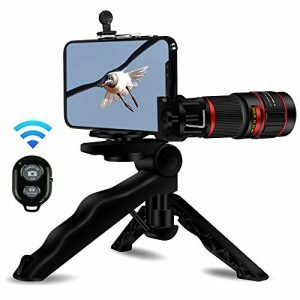 ▶ENHANCED TRIPOD AND HANDY WIRELESS REMOTE SHUTTER – Extendable tripod helps minimize blurriness from a shaky hand, stabilization is also handy when you’re shooting video.The wireless remote shutter unchain yourself from your phone. Position your phone, jump in the shot and click the control button from up to 30 feet away,snap stunning selfies and group photos with your friends and family from afar with ease,say goodbye to blurry photos. 8x lens magnification and 18mm objective lens bring a ultimate photography experience to you. It’s a zoom lens,the focus and the photo quality all up to the phone camera. For better focus, Use the lens in good status and enviroment, dont shake your hands. 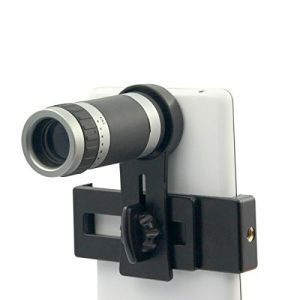 This lens use a adjustable mounting bracket to make the lens attached with the phone camera.there is a crew can make the bracket tight or loose. 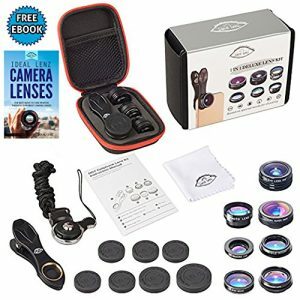 ▶6 Most Popular Lenses in 1 Kit: There are 5 professional lenses with 6 powerful features – 12x zoom, 235° fisheye, 20x macro & 0.62x wide angle, starburst, and CPL, meeting all your demands and letting you instantly share incredible photos on social networks! ▶Versatile for Shooting Great Photos: Telephoto Zoom- enables to get close to your subject and gives vivid details. Wide Angle- captures expansive scenes, is ideal for group shot. Macro- discovers and delivers amazing close-ups. Fisheye- Creates funny fabulous fisheye photos. Starburst- adds beautiful star effect, and CPL- eliminates unwanted reflected glare. 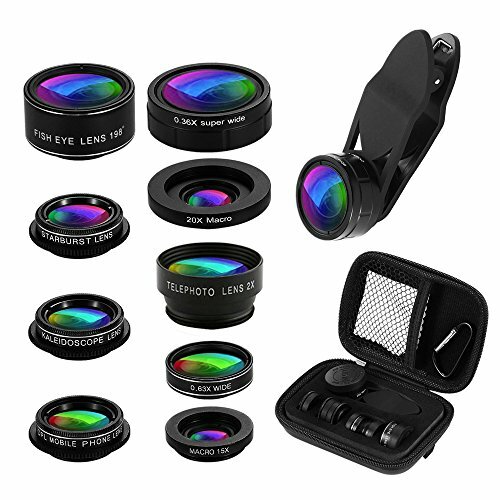 ▶Best Gift for Everyone: The lens kit is perfect for everyone, from your BFF to your parents. 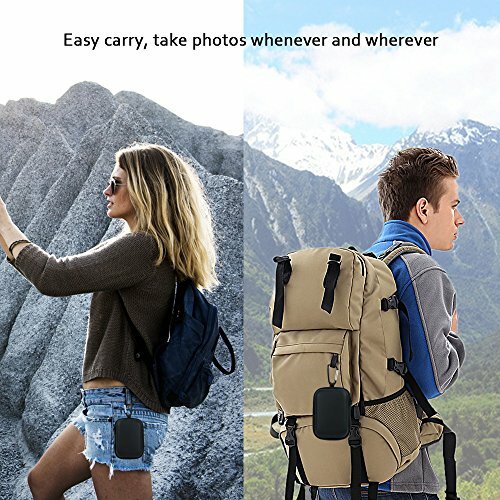 It fits in your pocket and easy to install, carry and store, taking the photos for party, music festival, camping, hiking, traveling, bird watching etc. and keeping all your delightful memories. ★Function★: It overcomes the shortcoming that the camera phone can only take short distance photos instead of long distance, so that the long distance vision can be presented clearly in your eyes, it has 20 times zoom and adjustable focal length. 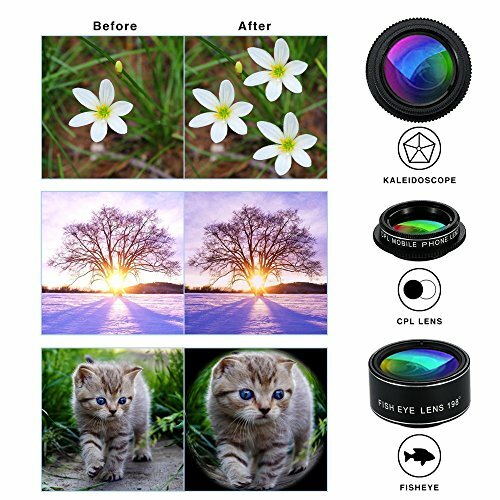 ★Advantage★: The new light path design, super wide angle, the amount of passed light, high resolution, good color reduction, which greatly improve the quality of mobile imaging. 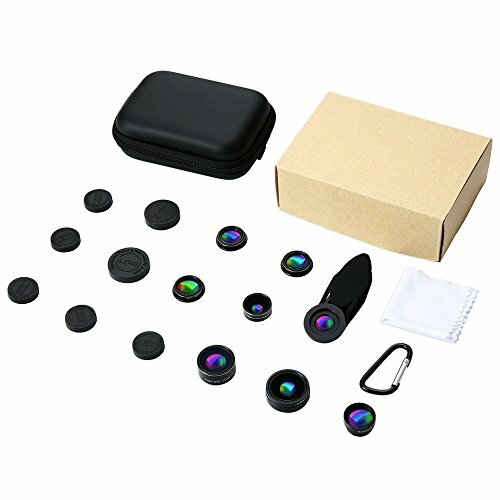 5-in-1 detachable lens for mobile phones and tablets,198 degree fisheye lens,0.63 wide angle lens,15x macro lens,2X telephoto lens, CPL Lens. You can create more interesting images. Made of high quality advanced glass and light aluminum alloy shell, universal detachable clip design, it works on most types of mobile phone that camera lenses diameter are not bigger than 13mm. 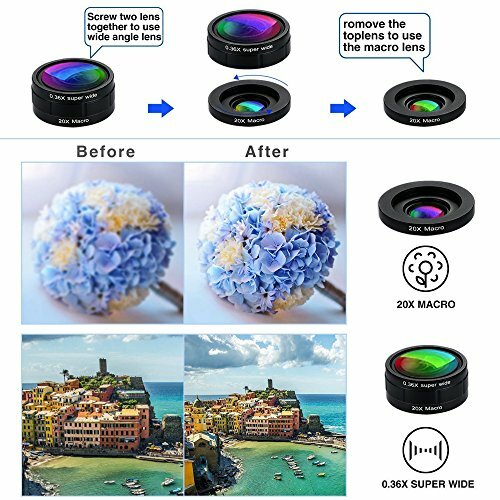 With fish-eye lens you can create interesting tubby images;macro lens is used for taking extreme close-up pictures of very small objects;wide-angle lens helps shot more landscape,which brings you into an amazing world.